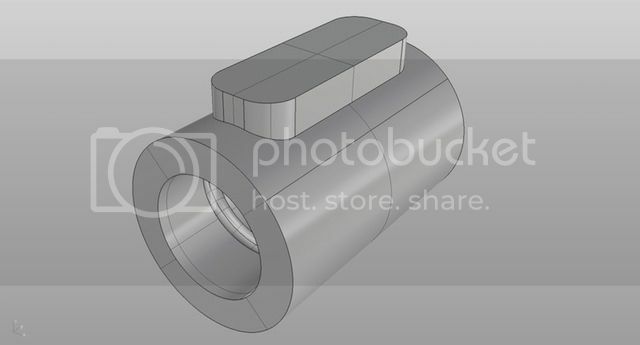 With all the new CNC stuff kicking off and wanting a better understanding of how things work I thought I would have a go designing and printing my own ball nut. I got some off cuts of 1205 ballscrew to use for setting up the future mill project. First job was always going to be a 3D model of the parts, so might as well start with the ballscrew. Measurment of the OD and radius of the raceway indicated 11.86mm and 2mm ballbearings. The centre of the balls are at 12mm and the ballscrew has clearance, hence the 11.86mm OD. To model this I start off with a 12mm rod, wrap a helical curve round the rod (5mm pitch). 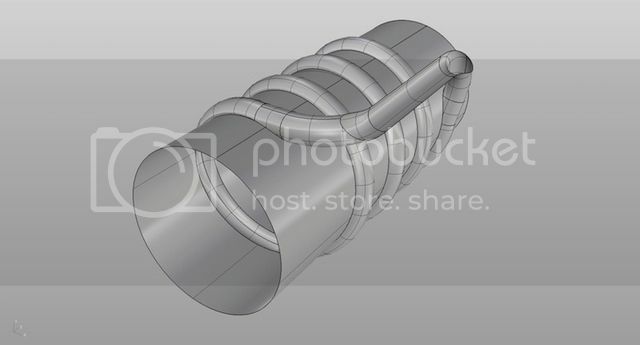 In Rhino I can use the pipe command to create a 2mm pipe along the curve, thats going to be our raceway. Next, create another rod, but this time it's 11.87mm diameter. Move the pipe from the centre of the 12mm to the new, now delete the pipe from the new rod. Easy, created the ballscrew, well as much of it as we need for modelling. 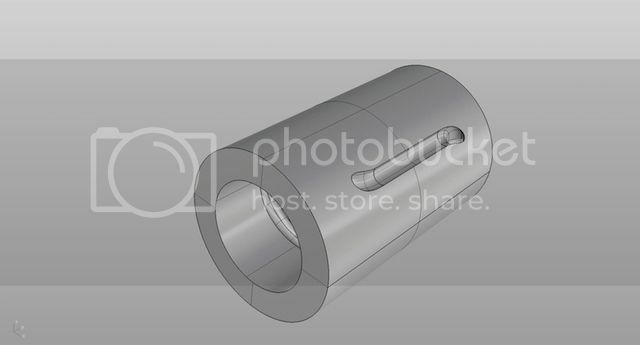 To create the nut I need a part I can work from in the form of a tube with the raceway cut out of that. The tube I generated has a 12.23mm bore and 19mm OD, just rough values to get started. This time we take pipe away from the tube to get its internal raceway. 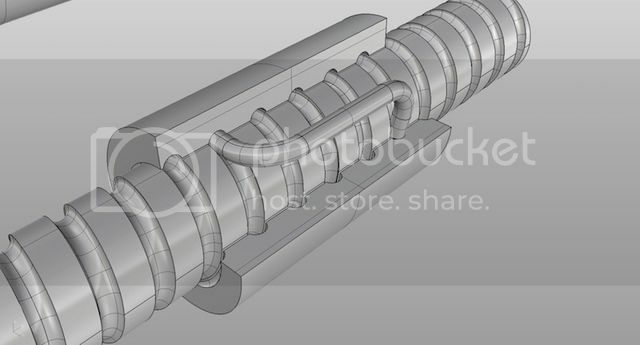 A sectioned tube shows the internals that I will use in modelling the nut, and thats as far as we are at the moment. 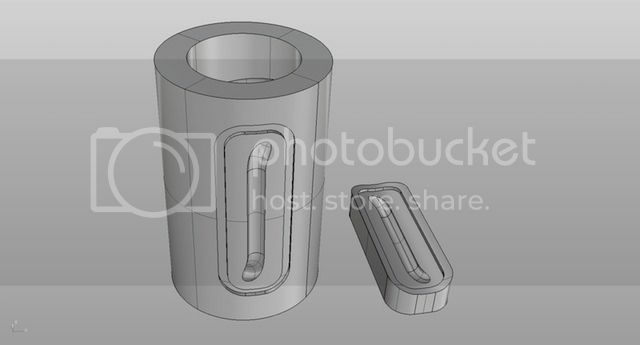 I am interested in how these work and how bad a printed nut will be, if it can be tweaked to be of any use in light applications or the CAD model will just be used for designing the mill setup and any future CNC machines that need parts modelling. In the mean time it's a fun challenge to get me thinking. Joules - if the balls are "full contact", I wonder what effect the inevitable "corrugations" resulting from FDM 3D printing will have? 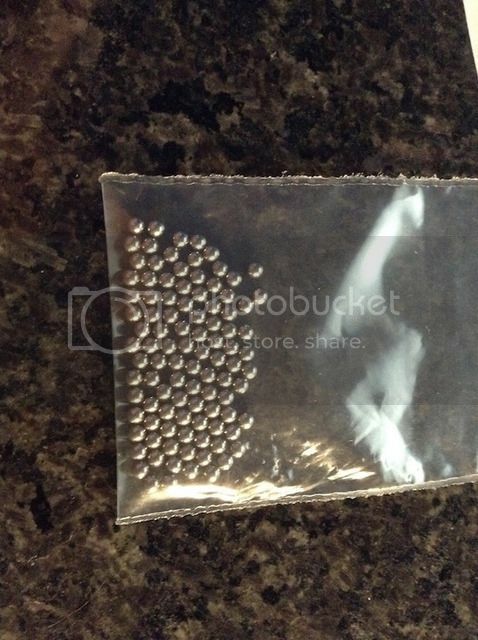 Personally I think that it's a load of balls. Dave, I expect some Shake, Rattle and Roll ah-ha.... I am anticipating the balls rolling a smooth-er path through the nut, getting "A" tolerance will be fun. Graunchy start and see where it goes from there. I recon John sums up the eventual out come of this. Where next - - if you find that FDM doesn't give a smooth enough ball raceway, then obviously the next step is to upgrade the printer - some sort of selective laser sintering unit? That would be robot arm operated MIG welder then. I finished up the nut design this morning. I like little exercises like this as they make you think and keep the drawing skills sharp. I took the sectioned nut and made a start on the recirculation path for the balls. The balls have to come off, and return to the ballscrew at the helix angle, I also added an incline of the same angle to increase clearance over the existing raceway in the nut. The pipe command is used on the curve I generated and a good radius for the bends. This is the internal raceway once I have cleaned up the nut of the excess raceway exiting the nut and combined the pipe we added earlier. The raceway has also been trimmed where it breaks the surface of the nut. So we end up with a basic nut like this, with the exposed raceway where we can load the balls later. Finally for this part we need to cap that open raceway. The cap is nothing fancy, but having a flat face helps printing it later. Here we see the finished components, the cap had a lip extruded round it and trimmed to take a matching cut out of the nut for alignment and gluing in when the nut is assembled. The pipe we drew earlier was used to trim the raceway in the cap. The nut is stood vertical ready to be printed with the cap at its side. In all honesty as a printed part this just wouldn't work. 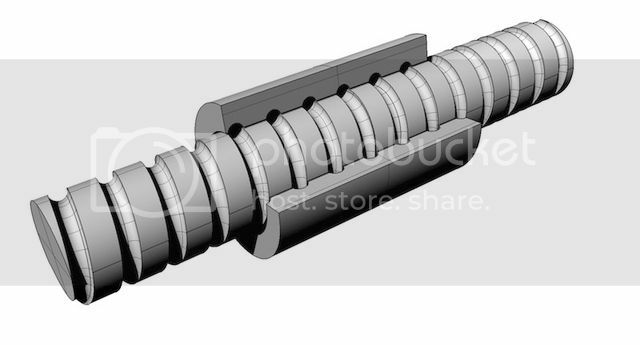 I would need to add clearance to the raceway in the nut for the balls to move, the error in my printer layers would most likely mean the raceway at one end won't line up with the raceway on the ball screw. However it has given me insight into how a nut works and can be designed, much respect for the companies that make these things and the precision they achieve. If I happen on a bag of 2mm BB's I may have a go at printing this with some tweaking of the tolerances to line things up. 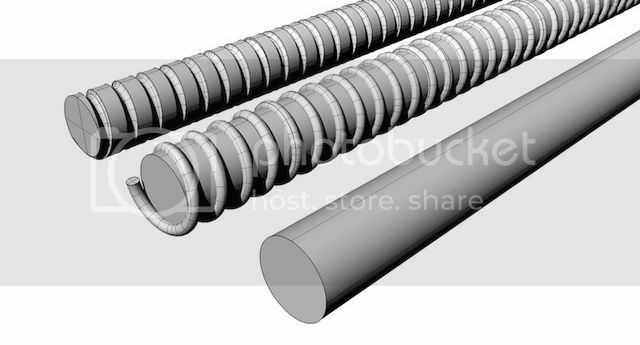 My thoughts are as the ball screw is hard it would peen the soft nut raceway into a good surface, not sure about the raceway tube, that might need to swell a little to allow free movement without too much bunching. I'm still pretty chuffed that I managed to draw up a reasonable model that I feel would work and write up the results here in just a few hours. CAD is all about doing, making virtual swarf. Please add a LIKE if you download it. There are few methods and variation on ball circulation. I don't think this will be highly succesfull on other than demostration and a learnig curve - but that is prett much. I can't wait to see your printed prototype. That would be a very cool toy to have on your desk . If you fill the raceway with something like PTFE grease before packing the balls, wouldn't it to a limited extent fill the print corrugations and make them act like oil grooves on a slide-way? With the fine resolutions you achieve on your prints I would be very surprised if this printed ball screw doesn't work. Thanks Pekka, the tangential ball return got my attention, it would make for a much simpler nut with inserts at each end for the raceway pickups. nrml, pretty sure if I printed a section of ball screw it would all work, but matching the precision of the metal would be a tall order. No doubt the plastic raceway would deform to accommodate. Excellent work .. and is the kind of thing 3d printers will some day be good for. It is usually an ogive arch, and has three points of contact. Goal is to have a arch a little bit smaller than the ball, so the ball is in compression with zero play. We made some nuts, for a customer demo, who manufactures lower-accuracy (motive) ballscrews industrially. Used an ST30Y, with live tools, and back-broached the path for the balls from HS to TS end. Using custom ground carbide tool tips (12€ each). Errors were way under 0.01 mm on customer go-no go gages. Took about 5-8 minutes per nut, using about 0.02 mm cuts, in a softer material similar to phospor bronze, I think. hanermo, thank you, detail like that is very useful. I literally just sat down and from what I had seen and perceived of ball screw nuts designed this as a starter to increase my understanding and knowledge. Details like yours and the others help greatly. I help where I can, when I think It might be helpful. I also learned from others with more experience. As my area straddles industrial and commercial stuff, sometimes my posts get mis-interpreted as erroneous, arrogant, or boasting, which is never my intention. Most customer-related stuff is off-limits, as they don´t want their confidants to spread info. (I was the commercial mgr for Haas Spain, 2011-2012). I respect that, leading to, mostly, unfortunately few details. Some customers have given explicit permission. The ballscrew model I liked, as one of the challenges I mention in CAD-CAM posts is modelling a ballscrew. Accurately (less than 1 micron error, so it could be made-from-model). So it can be made (cannot have abrupt cut-off in groove, for example (or how will it be cut ?). 2. how long will it take You ? (estimate before starting). How accurate was Your estimate ? 3. how accurate will it be ? Sure ? Explain sure. 4. how large will the model be ? I made my model in rhino 3d, in 2014/2015 or so, V5, in about 1 hr, for a 30MB file of accurate solids. 1 hr of research (but I knew a lot about ballscrews). I used an ogive arch, so its theoretically somewhat correct, but I did not look for a "correct" arch. I suspect it does not really matter. A 5-axis grinder with plunge grind and shape dressed via diamond could finish the screw, correctly. Imho. Grinder or live tool lathe or cnc lathe could rough the screw (hardness and support considerations). It amazes me every time I think about 3D printers. The 3D print resolutions that you're talking about, from reasonably affordable printers, were the minimum sizes for cutting edge integrated circuit devices when I was in school for my BSEE. My goal was to make a model that could be used directly in a cnc grinder. The most accurate grinders I have seen, were at a customer, at 0.7 microns. They use them to grind solid carbide. They are the punches, ie molds, and run about 400 times/minute. 20 l paint cans run at 80/min. Apparently, they need 1-2 microns accuracy. Another most unbeliavable anecdote, of their 50 machines, +/-, are made by about 45 different manufacturers. Well they have to work to microns Hannu or they wouldn't appear on your radar. Post us a picture of a finished ball nut or the drawing like Joules has. I got some stick for not printing a nut. So I am going to man up, and order some BALL's then start on getting a working print done. At least you will print and show yours. You will never see anything that Hannu has 'made' as its all virtual. 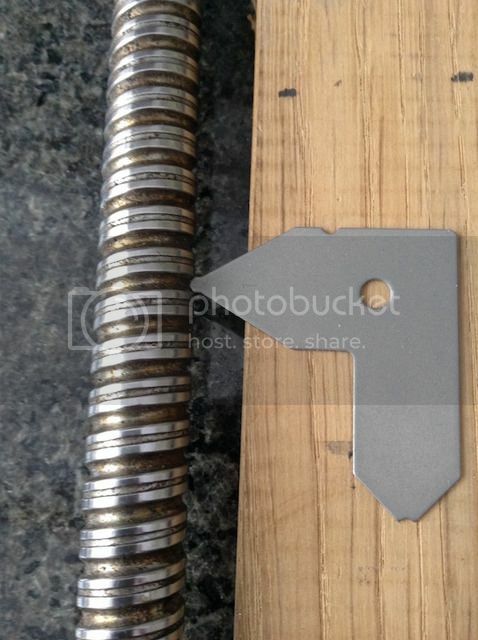 This guy has been on the Mach3 forum for years spouting his sub microns accuracy designs and other than a crude jig he showed once made out an old pallet and a length of stuffing, no one has seen any of these futuristic machines he's only months away from marketing. 8 inches of 2mm ballbearings, better get a sealable box to play with them in, or they are going to get lost in no time.